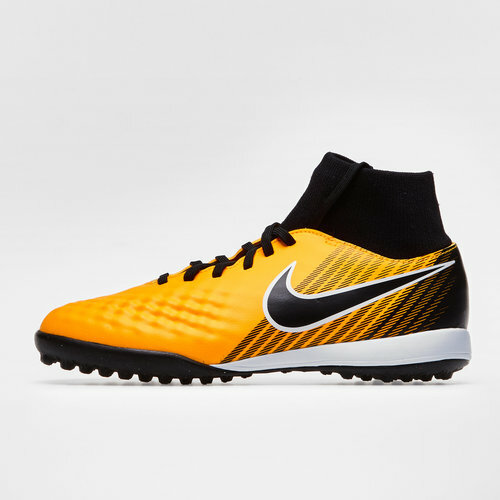 For the younger ones looking to become the creative, playmaker in the team, raise the standard when you pull on the Nike MagistaX Onda II Dynamic Fit Kids TF Football Trainers in Laser Orange, Black, White and Volt. This generation of Magista Trainers carries through the same top quality features from to help get the best out of creative players. The top quality Onda II has a lightweight synthetic upper that delivers a comfortable and snug feel which moulds to the wearer's foot. For a snug all-in-one fit, this trainer includes a sock-like Dynamic Fit collar. An external heel counter offers protection and stability too, allowing the wearer to focus more on their game rather than their feet.